Ungheni (pronounced “Unghen” in Romanian) began in the late 14th century as a very small settlement along the east bank of the Prut River (also referred to as Pruth River)1, The Prut, a tributary of the Danube River, has since, from time to time, formed a national boundary separating interests controlling the eastern bank (where Ungheni is located) from the controlling interests on its western bank. In the early part of the 19th century, Ungheni had a population in the low hundreds. Ungheni and the neighboring area was primarily agricultural, reflecting the principal economy of that region. The Prut River, less than 100 feet wide and not deep, was not viewed as navigable. The navigability of the nearby Danube made Ungheni of little importance until the Russian Empire took control of the territory on the west side of the Prut under an 1812 treaty. Under its governance the entire area on the east side of the Prut, named Bessarabia (sometimes Basarabia) by its prior rulers, became part of the Pale of Settlement. Although its size changed due to succeeding treaties, Bessarabia continued as a province of Russia until after World War I. For this entire 100-year period, Ungheni was located within Bessarabia. As a result of policies adopted in the 1850s, Jews and other non-Russians living in northern Russia were subject to restrictive laws and harassment, making it difficult to survive. Together with rampant state-inspired anti-Semitism, and a series of incentives by various tsars offering the prospect of a better and less restricted life to Jews in Bessarabia, an influx of Jewish population to Bessarabia began. However, Ungheni and its surrounding agricultural communities remained a relative backwater area, with only a few hundred residents involved in an agricultural and craft economy. In 1871, the Russia government began to expand its nascent railroad network into Bessarabia. Russia’s intent was to establish a means of moving soldiers and war materiel to wage the Russo-Turkish war a few years later. In 1873, the Russian government, with the agreement of the Romanian government established on the western shore of the Prut, built a bridge across the river, the first of its kind. A railroad line built in 1875 connected Ungheni to Kishinev, the capital of the province, and points north into the heartland of Russia. 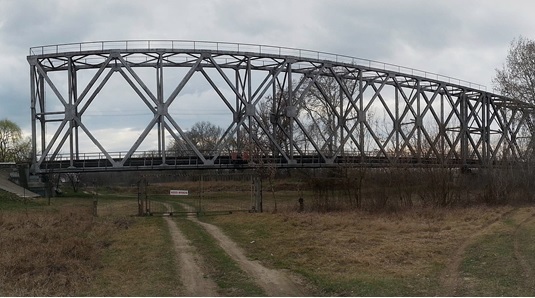 After a first bridge to connect Ungheni with points west burned, Russia engaged Gustav Eiffel (of Eiffel Tower fame) to construct a steel bridge over the Prut at Ungheni. Eiffel’s bridge, which continues in use today, established a reliable railroad connection over the Prut. This passage has historically been impeded by use of different track gauges between the two sides of the river, causing hours of delay for passengers and freight in shifting railroad cars from one gauge of track to another. In response to these factors, Ungheni’s population grew but slowly, so that by 1897, its population consisted of 2,694. Jews, totaling 997, constituted almost 40% of the total, a fairly typical concentration within Bessarabia. As pogroms occurred in the larger Bessarabian towns, including nearby Kishinev, and as Russian needs for soldiers grew into a draft that compelled Jewish young men to be threatened with decades-long service for the Russian military in the Russo-Japanese War among other conflicts, Jews began to migrate, mostly to the United States and some to South America. With a significant Zionist movement embraced by Jews in Bessarabia, others went to Palestine. As a result of the treaty that ended World War I, Romania acquired control of most of Bessarabia, including Ungheni. Ungheni had lost its strategic importance. Nevertheless, it grew in population likely due to absence of any political division between Ungheni and nearby Iasi (Jassy in Romanian), the second largest Romanian city that was literally the next stop east on the railroad line that passed over the Eiffel Bridge from Ungheni. As both Iasi and Kishinev had large Jewish populations, Ungheni replenished its Jewish population. In 1930, 1,390 of Ungheni’s 3,253 residents were Jews. After both Nazi and Romanian Holocaust killing squads devastated the Jewish population throughout this area, the Soviet Union won control of Moldova, establishing the Moldavan Soviet Socialist Republic. Under Soviet rule, Ungheni’s population grew substantially, to its present 30,000 or so, with a very small remaining Jewish presence, as many of the surviving Jews left for Israel or other places. With the collapse of the Soviet Union, Moldova, still with a poor agriculturally-based economy, became an independent nation, maintaining strong connections both with Europe and Russia. The relationship with Russia diminished greatly after a Russian inspired military action led to the separation of the most eastern part of Moldova, Transnistria, into a disputed Russian outpost. The Prut River is becoming a significant navigable river, at least from the Danube to Ungheni, and with the ease of passports and commerce with Romania, a member of the European Economic Community, Ungheni’s future, at least economically, is positive.